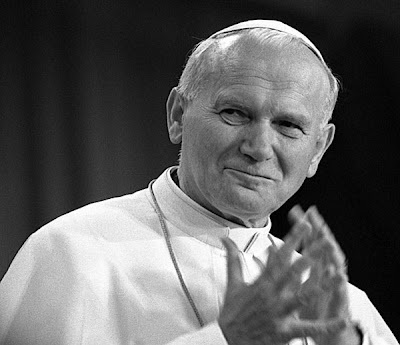 Hopefully it's no surprise to anyone that the cause for canonization of Wojtyla Magnus (or is it Amatus now?) continues apace. The relic is a small piece of one of the white cassocks worn by Pope John Paul. The free cards and relics can be requested by letter, fax or e-mail, she said. The e-mail address is: Postulazione.GiovanniPaoloII@VicariatusUrbis.org; the fax number is: (39-06) 6888-6240. The mailing address is: Postulazione Giovanni Paolo II, Vicariato di Roma, Piazza San Giovanni in Laterano 6A, 00184 Rome, Italy. Economic justice, corruption, migration, education and civic participation are among the issues that bishops in the region will discuss at the conference, which is expected to draw more than 160 voting bishops and 80 other participants to Aparecida, Brazil, outside Sao Paulo, May 13-31. Pope Benedict XVI, who will travel to Brazil for a five-day visit May 9-13, will officially open the conference. In a meeting with papal nuncios from Latin America in Rome Feb. 17, the pope outlined some of the issues church leaders face in Latin America, including the growth of evangelical churches -- still generally referred to as "sects" in this majority-Catholic region -- and "the growing influence of postmodern hedonistic secularism." In examining the reasons for the lure of Pentecostalism, the bishops will have to take a critical look at the Catholic Church's own practices. Part of the attraction of other churches lies in "a failure to awaken a missionary commitment in Catholics and a lack of priests and religious," said Cardinal Javier Errazuriz Ossa of Santiago, Chile, who is president of the Latin American bishops' council, or CELAM. "It's not that people leave the Catholic Church because they oppose it, but in seeking a relationship with God and seeking the Gospel, and having lost a livelier contact with Catholic communities, they go to other pastors who are talking about Jesus Christ," Cardinal Errazuriz said. The conference's dual emphasis on discipleship and missionary commitment is meant to spur an awakening so that "every Catholic feels called by Jesus Christ to be a disciple and to be sent out to change the world in accordance with the Gospel," he said. The bishops must grapple with how to educate Catholics to take on that task, he said. Although Pope John Paul II once called Latin America "the continent of hope," a brighter future remains elusive for nearly half the region's people. More than 40 percent live in poverty, and income distribution is the most unequal in the world. In countries such as Chile, Mexico, Colombia, Peru, El Salvador and Guatemala, the wealthiest one-fifth of the population receives half the country's income, while the poorest one-fifth take home a scant 3 percent. "This is poverty born of social and economic inequality, poverty that affects human life and dignity, and poverty that is a form of violence," Bishop Ramazzini said. Bishop William Skylstad of Spokane, president of the US Conference of Catholic Bishops, has been specially invited as a voting delegate. Attorneys representing the plaintiffs, however, strongly disputed that statement. Settlements in California have been in the range of $1.1 million to about $1.6 million per case, plaintiffs' attorneys said. The diocese's offer was “substantially” less than that, said one source close to the negotiations. Claims from the 150 or so allegations of sexual abuse involving 60 priests and dating to the 1950s could top $200 million, according to the plaintiffs. Prior background here and here. The Bishop of Lancaster fears this disconnection poses a much greater threat to the church than its £10m of debt or its crumbling buildings across the diocese. And now he wants to know what congregations from St Walburge's Church in Ashton, Preston, right up to Christ the King in Carlisle, Cumbria, want to do about it. "I want to get people thinking about what kind of people we are, what kind of parishes we are and what kind of a diocese we are," he says. The questioning will begin when priests across the diocese read out a letter from the Bishop to congregations on Sunday. He adds: "What you will not find here is a great programme – rather it is a summons to radical change in each one of us, our parish and diocese, making us all more open to the Lord." My passion for Mission - making Christ known and loved - continues to grow.... I believe that we are tantalisingly near great new beginnings in the Church if only we capture something of the spirit of the Gospel - a deepening of Faith, coupled with confidence to know that Christ walks every step with us. He invites you and me - to cast out into the deep for without Him we will catch nothing. There is one other thing: we need to join the Pilgrim People of God in the journey of faith and reconciliation that began on Ash Wednesday. Be ready to speak about it, especially to those close to you who seem to have wandered away from the family of the Church. How wonderful it would be for them to see in us the promise of an affectionate, merciful and joyful welcome home. The readings at our Lenten Mass today, help with our Mission Review. They speak loudly of what God has already done for us - thus giving great hope. They call us, not only to repent of our sins, but to open our hearts to God and move forward in faith. Jesus' temptations emphasise the importance of fidelity to God's promptings in life. May the investment bear many happy returns. It may be Oscar Night here in the States, but speaking of ballots and A-listers, by this time next year the Jesuits will have accorded one of their own the highest honor the church's largest order can bestow: the post of Superior-General of the Society of Jesus, the 29th successor to Ignatius of Loyola. Plans continue apace for the Company's 35th General Congregation, which begins in the Urb in the first week of 2008. Given the stated wish of incumbent Father-General Peter-Hans Kolvenbach to retire from the worldwide community's top office after 25 years, GC35 will witness the peaceful transition of leadership from a living General to his successor for the first time in the Jesuits' five centuries of existence. In recent days, more info on the gathering was communicated to the Society's provincials and the Congregation's already chosen electors. Included among the news was the membership of the gathering's top preparatory council, and a response from Pope Benedict XVI to Kolvenbach's query on the long-term effect of his retirement. "Furthermore," Kolvenbach told his confreres, Benedict "expressed the desire" that the GC focus on the Jesuits' "spiritual and ecclesial formation of young Jesuits," and on "the value and observance of the 4th vow for the whole Society." In addition to the evangelical counsels of poverty, chastity and obedience, the Company's senior professed pledge a unique and complete obedience to the person of the Roman Pontiff in the service of the missions. The Father-General cited that the Pope had already mentioned this "concern" in his address to the Jesuits last April. Next month, the work of the Coetus Praevius -- the Congregation's chief preparatory body -- begins. Numbering 15 top Jesuits and headed by Kolvenbach, it includes two previously-named frontrunners for the General's post: the Society's second-in-command, Indian Fr Lisbert D'Souza, and Belgian Fr Mark Rotsaert, the head of the European Jesuit Conference. Others include the Company's top men in Africa, Central Latin America, East Asia, the Philippines and the US. Of the 15, three are from South Asia, now home to the order's largest regional grouping. In token of the level of interest in the GC -- and the ramped-up amount of documents that'll be flowing out to the membership -- a thorough reworking of the Jesuits' main international website has been rolled out. The second month of 2007 is almost out, and only at its end will the US see its first episcopal ordination of the year. Six months after the nation's hierarchy converged on New Orleans to celebrate a triple jubilee, the circuit returns to town on Wednesday for the ordination of Auxiliary Bishop-elect Shelton Fabre. At 43, Fabre (pronounced "FOB") becomes the youngest American bishop. Before his December appointment, no US priest had been elevated to the episcopacy short of his 45th birthday since 2001; since 1990, Fabre is but the fifth named in his early forties. Until now a pastor and high school chaplain in his native diocese of Baton Rouge, the bishop-elect is staying put until the last possible moment; he's spending one final weekend with his parishioners before leaving for New Orleans later today. He'll serve as a co-vicar general of the archdiocese alongside current auxiliary Roger Morin, and will pastor a parish in the Big Easy, where the church continues a significant rebuilding following 2005's Hurricane Katrina. For Baton Rouge, it's been an effusive, bittersweet farewell. At a vespers service last month in its cathedral, the diocesan paper reported that Bishop Robert Muench and priests in attendance each crossed Fabre with holy water, and one cleric said that "tears could be seen streaming down his face." His confreres have praised him as a "tremendous pastor," a uniting figure beloved by people and priests alike in the diverse and sprawling diocese, some of whom have referred to him as "our Fabre." In a notable move, the diocese is loaning Fabre the funds for his episcopal vestments. His pectoral cross and crozier are presents from the hometown crowd, but the rest he'll have to repay from the customary ordination gifts. The first alum of the American College Louvain to be named a US bishop since 1999, Fabre is the first African-American priest Benedict XVI has tapped to share in the fullness of the priesthood. 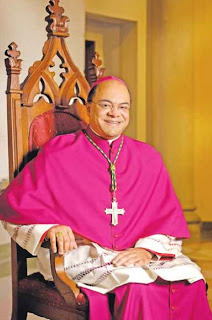 He joins nine active and five retired black bishops in the US hierarchy, one of whom -- Bishop John Ricard SSJ of Pensacola-Tallahassee -- is his father's first cousin. 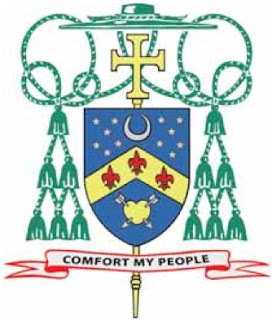 Ricard, Muench and New Orleans Archbishop Alfred Hughes will serve as principal consecrators at the ordination, to be held in the Crescent City's historic Cathedral-Basilica of St Louis, at which both of Fabre's parents will be present. For his motto, the bishop-elect has chosen a favorite exhortation, taken from the prophet Isaiah: "Comfort My People." Twenty years ago tomorrow, John Paul II named then-Msgr Piero Marini as Master of Papal Liturgical Celebrations. The liturgist of the age and now an archbishop, Marini's quiet presence at the side of two Popes culminated in his arrangement of the interregnum of 2005, the most-watched manifestations of Catholic worship in human history. His tenure's signal accomplishment, most prominently in those days but consistent over the thousands of events conducted under his watch, has been the development of the papal Eucharistic celebration as captivating media event, while maintaining its premium on dignity, richness of heritage, and especially its chief purpose as an experience of prayer. As English translations of Marini's reflections on the history of papal liturgy and Sacrosanctum Concilium -- the Second Vatican Council's Decree on the Liturgy -- are on their way, the Holy See has published an English translation of Marini's intro to his latest, a commentary on the rite of inauguration of the Petrine ministry. In light of the conciliar renewal, the definitive Ordo Rituum pro Ministerii Petrini Initio Romae Episcopi [Order of Rites for the Beginning of the Petrine Ministry of the Bishop of Rome] was prepared by the Maestro and his staff as the fruit of a years-long process. The words Jesus which spoke to Peter at Caesarea Philippi and on the shore of the Sea of Galilee, he repeated to Benedict XVI at the beginning of his ministry, through the liturgy of the Church. Celebrating God's fidelity to his Church, these liturgies made present the hodie of the Petrine ministry. It is this same hodie which explains why the ministry of the Bishop of Rome begins with a liturgy. It is always in the liturgy, and in particular in the Eucharistic assembly, that the Church recognises, acclaims and thanks God for his gifts. So by clearly inaugurating the Petrine Ministry with liturgical celebrations, the Church shows that this ministry is first and foremost a gift of God to his Church. It is the Lord's own Church over which the successor of St Peter is called to preside in charity. That is why the Evangelists stress that in the words with which Jesus institutes the Petrine ministry, he reminds Cephas that the Church remains the Lord's Church, his own Church: “You are Peter, the rock and upon this rock I will build my Church” and “Feed my lambs... Feed my sheep”. 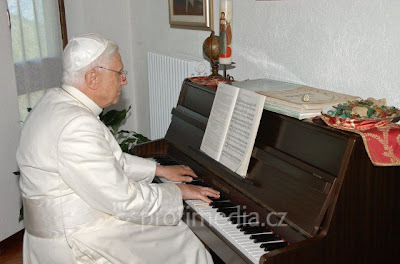 The Petrine ministry of Benedict XVI began with the liturgy in a special way. The Ordo Rituum pro Ministerii Petrini Initio Romae Episcopi was the first official document approved by the Pontiff, on the very day after his election to the Chair of Peter, as can be seen from the rescript ex audentia Summi Pontificis dated 20 April 2005. I am moved as I recall my first audience with His Holiness, at which I submitted the new rite for his examination. The Pope went through the whole liturgy, noting and endorsing the various decisions made for the new Ordo. Indeed, as he examined the document, the Pope repeatedly commented on the beauty of the texts, the signs and the unfolding of the rite, and he expressed his appreciation that the work had been done in so a short period of time. Noting the rite's clear biblical inspiration and its continuity with the great tradition of the Catholic Church, the Pope identified the various patristic citations in the texts, including expressions of Ignatius of Antioch, Gregory the Great and Leo the Great. His Holiness asked if he could keep the book, in order to prepare for the liturgy and to meditate on the euchological texts and the signs of the imposition of the pallium and the fisherman’s ring. One fruit of that meditation was the evocative mystagogical commentary on the pallium and the ring which the Pope offered during his homily at the liturgical celebration of the beginning of his ministry. The text of the homilies of 24 April and 7 May 2005 is introduced by a study highlighting the mystagogical method employed by Pope Benedict XVI. The Pope situated the homilies in God's saving plan and “involved the faithful in the adventure to which the Lord had called him: an adventure which began with the journey of the liturgy which is the journey of the Church”. “'The norm of the holy Fathers' demands not only the preservation of what our immediate forebears have passed on to us, but also an understanding and a more profound study of the Church's entire past and of all the ways in which her one and only faith has been set forth in the quite diverse human and social forms prevailing in the Semitic, Greek and Latin areas. Moreover this broader view allows us to see how the Holy Spirit endows the People of God with a marvellous fidelity in preserving the inalterable deposit of faith, even amid a very great variety of prayers and rites” (No. 9). The new Ordo succeeds in “preserving unchanged the deposit of faith” regarding the Petrine ministry, as received and passed on by the great Catholic tradition in uninterrupted communion through the centuries. The rites of the new Ordo “for the beginning of the pastoral service of the Bishop of Rome” as His Holiness Benedict XVI approved them and, above all, celebrated them, testify to and hand on a vision of the Petrine primacy which is faithful to the biblical data, the tradition of the Church Fathers and the essential understanding which the Church has always had of this ministry. 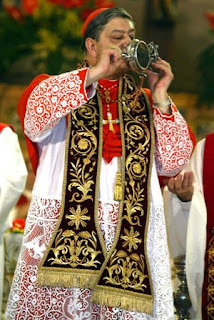 Hence the liturgy of the Ordo Rituum pro Ministerii Petrini Initio Romae Episcopi can be considered a legitimate locus theologicus and an authoritative witness to the handing on the Catholic vision of the Petrine ministry. The Ordo, now fully integrated into the lex orandi of the Church, can henceforth serve as an essential resource for the theological formulation of the Petrine ministry. The Ordo Rituum pro Ministerii Petrini Initio Romae Episcopi, as this commentary shows, can be considered, because of its singular ecclesial and ecumenical value, a gift and an encouragement not only for scholars, historians and the faithful in general, but for all the Churches of West and East. The Rites of the beginning of the Petrine ministry, broadcast all over the world by the communications media in the Easter season of 2005, were a celebration of the mystery of Christ the Good Shepherd, who down through the centuries, by means of the Petrine ministry entrusted to the humble fisherman of Galilee, continues, as Head of the College of Bishops (cf. Lumen Gentium, 22), together with the Bishops who are members of the same body (cf. Christus Dominus, 4), to guide his flock towards the Kingdom. This presence and ministry find in the liturgical celebration their origin and their relevance. Truly, the rites for the beginning of the pontificate, celebrated in the spirit of the liturgy of the Second Vatican Council, are a sign and a source of hope for the pilgrim Church's journey in the world. Buona festa, Maestro.... Suffice it to say, somewhere in the great beyond, Bugnini is smiling. 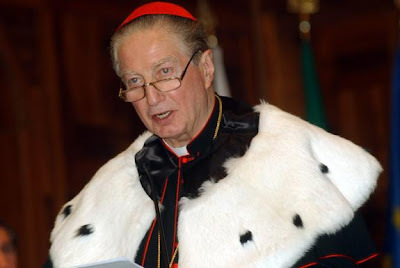 Some of you might remember Cardinal Crescenzio Sepe, the onetime top curialist/capo della famiglia Irpinia who Papa Ratzi dispatched last year to the archbishopric of Naples. The former Assesore of the Secretariat of State and master-builder of the Great Jubilee, who inherited the moniker of the "Red Pope" as prefect of what they still call the Propaganda Fide, Sepe's first Lent in the place best known for Mafiosi lore and San Gennaro's annually-liquefying blood has been marked by a rather curious initiative: a call for the youth of Italy's murder capital to "unsheath [their] courage" and hand over their knives in church, anonymously and without penalty. The campaign, first reported on by Robert Mickens in last week's edition of The Tablet, even included Sepe's hope that "the kids left a few grams of drugs" behind as well. But this week, Mickens' Letter from Rome sends word that "20 knives were handed over by local hoods" in the program's first eight days. The results were trumpeted, of course, in the pages of L'Osservatore Romano, which, he observes, "still [has] some highly placed Sepe devotees"; the former head of Stato's Information Office is credited with the hiring of current Osservatore editor Mario Agnes in 1984, the same year he nabbed the then-head of the Italian foreign press, Joaquin Navarro-Valls, to serve as director of the Holy See Press Office. Whatever the case, remember well that Sepe's only 62. And, clearly, Rome hasn't heard the last of him yet. Cardinal Karl Lehmann said in Bild newspaper on Thursday that the period of 40 days before Easter in the Christian calendar "requires us to rethink our lifestyle." "Far too often, we do things that are harmful to our fellow citizens and the environment. "Preserving creation is a duty which falls to all of us," Lehmann, the chairman of the German bishops' conference, said. We have been subjected to a lot of nonsense about climate disasters as some zealots have been painting extreme scenarios to frighten us. They claim ocean levels are about to rise spectacularly, that there could be the occasional tsunami as high as an eight story building, the Amazon basin could be destroyed as the ice cap in the Arctic and in Greenland melts. An overseas magazine called for Nuremberg-style trials for global warming skeptics while a U.S.A. television correspondent compared skeptics to “holocaust deniers”. A local newspaper editorial’s complaint about the doomsdayers’ religious enthusiasm is unfair to mainstream Christianity. Christians don’t go against reason although we sometimes go beyond it in faith to embrace probabilities. What we were seeing from the doomsdayers was an induced dose of mild hysteria, semi-religious if you like, but dangerously close to superstition. I am deeply skeptical about man-made catastrophic global warming, but still open to further evidence. I would be surprised if industrial pollution, and carbon emissions, had no ill effect at all. But enough is enough. The evidence on warming is mixed, often exaggerated, but often reassuring. Global warming has been increasing constantly since 1975 at the rate of less than one fifth of a degree centigrade per decade. The concentration of carbon dioxide increased surface temperatures more in winter than in summer and especially in mid and high latitudes over land, while there was a global cooling of the stratosphere. The East Anglia university climate research unit found that global temperatures did not increase between 1998 – 2005 and a recent NASA satellite found that the Southern Hemisphere has not warmed in the past 25 years. Is mild global warming a Northern phenomenon? While we might have been alarmed by the sighting of an iceberg off Dunedin as large as an aircraft carrier we should be consoled by the news that the Antarctic is getting colder and the ice is growing there. "On not a few occasions, inappropriate remarks glossing over the deceased's proclivities (drinking prowess, romantic conquests etc) or about the Church (attacking its moral teachings) have been made at funeral masses," [Cardinal George] Pell's new guidelines say. On a tangential note, two faithful friends of mine have been called home in the last week. Please say a word for their families in your prayers, in faith that those we mourn -- and all those gone before us marked with the sign of the same faith -- are experiencing the peace and joy of Paradise.... And that we, too, might join 'em there one day. The summit ended with the Episcopal church getting chastised. If it doesn't meet a set of bolt-tightening criteria. Or not, depending on who's interpreting the Primates' Communiqué. Sorry, it's all just too confusing -- the Roman beat's more than enough for these pages, and trying to figure it all out is why the Good Lord gave us places like TA. As is the way of these things in recent years, the latest biannual meeting of the leaders of the Anglican Communion's 38 provinces has been dominated by one issue: the place of homosexuals in its Churches and the power struggle for control within the American Episcopal Church between conservatives and liberals. It is a cause of frustration to several of them, especially meeting in one of the poorest countries on earth, that the world leaders of Anglicanism should spend their time discussing what middle-aged American Christians get up to in bed rather than issues of poverty, disease and hunger, but that is what a number of the African primates themselves wanted, spurred on by American and English conservative evangelicals dancing attendance upon them from the fringes of the meeting. In the old days - say a decade ago - the archbishops and presiding bishops of worldwide Anglicanism would meet in genteel seclusion, unbothered by the outside world, for prayer, Bible study, tentative theological discussion and a chance to get to know each other. Not any more: this week's meeting featured raw politics, power plays, tactics and boycotts. At first it seemed Akinola's faction, largely consisting of other equatorial African primates, would object to the admission to the meeting of the new American Presiding Bishop, Katharine Jefferts Schori, the first woman ever to lead a Christian denomination. There was even some consideration of giving her the cold shoulder. This was abandoned as a tactic, with the evangelicals fearing it would not play well even with their own supporters. Instead they settled for attempting the disciplining of the American Church: setting its rules and timescales for meeting the rest of the Communion's demands that it should row back on the consecration of any more gay bishops or the adoption of blessing services for gay couples - something the Americans had already basically accepted to do. The tactic was thrown into some disarray when a working party, led by Dr Williams, produced an unexpectedly favourable report on the Episcopal Church's attempt to fall into line. This scarcely gave the conservatives the ammunition they had been anticipating. Hence Akinola's hurried consultations in the hotel. His lobbyists eventually produced their own draft communiqué of demands, which in itself did not go down terribly well with the other African archbishops who had expected to be consulted before being asked to support it. The conservatives wanted indefinite moratoriums on gay blessings and bishops, and sanctions against the Episcopalians. They did not get them. The drafting of a communiqué went on late into Sunday night, the church officials well aware of the need to provide a united document, for fear that otherwise the Communion would be depicted as falling apart. At the last gasp, there was a settlement. It places unprecedented strictures on the Episcopalians, who essentially have seven months to comply if they are to be invited to next year's Lambeth Conference of all the world's Anglican bishops. So hurried was the cobbling together that it is by no means clear whether such mechanisms as a primatial vicar to oversee conservative dioceses in parallel to Jefferts Schori's oversight of liberal ones can be made to work. "It's an experiment," said Rowan Williams afterwards. "Pray for it." It may still be news to some people, but, indeed, bishops read the news, and watch it, and digest it as much as -- if not more than -- the rest of us do. And for anyone whose daily diet involves even a pinch of CNN, FOX, MSNBC or practically any newspaper here in the States, it's been near-impossible to get away from the news-channels' latest free-for-all: the death at 39 of the model/reality TV star/former Playmate Anna Nicole Smith two weeks back. You shouldn't be shocked to hear that the Anna Nicole story's being watched with more interest by more of our people than, say, the wave of parish closings and reconfigurations sweeping the East Coast. (Given the way some of the latter have panned out, however, it's up for grabs as to which has become more of a circus.) And not a few would see the former's developments, like a family fight over Smith's burial spot, warring claims over the paternity of her newborn daughter, and her history of revolving-door relationships and drug abuse, as a bit of a third rail. In light of all that, there's really been no ecclesiastical engagement of the story... that is, until now. Writing yesterday in his weekly diocesan-paper column, Bishop Robert Morlino of Madison connected the lessons of Anna Nicole's life and death with the wisdom of Tradition and the observance of Lent. During these days I am praying frequently for the repose of the soul of Anna Nicole Smith and I don't mean in any way to judge her - I do feel sorry and pray for her. But in her tragic life, the marriage bond has been tinkered with repeatedly, in terms of multiple partnerships and lately a quasi-marriage. The result is that her new-born baby could have one of six natural fathers; the rights of next of kin in this case will have to be determined by the courts. There will be custody battles among the candidates for natural father who are still alive, regardless of the identity of the natural father, and the connection between the new-born baby and almost a half-billion dollars from the estate of the deceased husband of Anna Nicole, all of these are in the legal mix. There is pending litigation about the house in which she lived and even over her human remains, as to funeral arrangements. It has been said that the litigation surrounding her death at this point is going to be the most complex litigation of this sort in all of history. It will take many years, and it will cost millions of dollars. When the state does not protect and reinforce the marriage bond and the true definition of marriage, everything is left to the courts and there is a lot of money to be made. The civil law was meant to reflect the law of reason - the natural law - and when it doesn't, there can result profound excesses in the litigation sphere as is evident here. When civil law opened the door to no-fault divorce and in-vitro fertilization, civil law started down the slippery slope that led us to the present moment. Tinkering with the marriage bond and with the definition of marriage empowers the courts to usurp decisions that belong to the traditional family and affords great wealth to eager litigators. The natural law is the guide both to freedom and to conscience in these very sensitive matters. I will try to write more about the natural law during this holy season, because the education and formation of human freedom and of human conscience depend very much on a correct understanding of the natural law. Of course all the education in the world does not give us a heart rooted in Christ. Prayer, along with works of penance and charity, form the core of our Lenten observance. When we receive ashes, and I am always thrilled at the number of people who want to participate in this beautiful rite of the Church, we are telling the Lord, we are telling the faith community by this public gesture, and we are telling ourselves that our Lenten observance will include more prayer, more works of penance, and more works of charity. Some might remember that Morlino -- a onetime Jesuit -- gave the keynote at last year's National Catholic Prayer Breakfast in Washington. The 2007 edition of the breakfast is fast-approaching; this year's falls within Easter Week. Its main speaker doesn't have to travel far at all this time: The Donald will be giving The Keynote. The Pope has begun his shake-up of the CEI -- the Italian episcopal conference -- elevating two of its top officials to the episcopacy this morning. The all-powerful conference's #3 official, Msgr Domenico Mogavero, has been named to head the diocese of Mazara del Vallo in his native Sicily, and its long-serving head of social communications Msgr Claudio Giuliodori was appointed bishop of Macerata-Tolentino-Recanati-Cingoli-Treia in the Marche, not far from his home of Ancona. 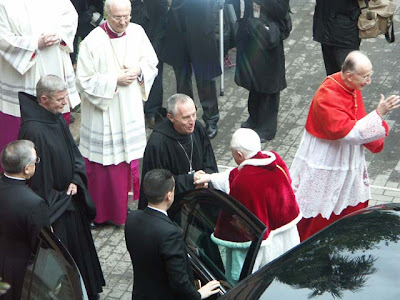 Benedict's "promovere e muovere" (moving by promotion) of two of Cardinal Camillo Ruini's senior lieutenants primes the ground for the 76 year-old prelate's long-awaited replacement as CEI president, ending his impressive 16-year reign at the helm of the Italian church's public policy and communications apparatus. As political complications encompassing both the secular polity and the Vatican had stalled action on the CEI's future in recent months, today's moves strengthen the hand of a new president to install his own people in the conference's nerve center with minimal difficulty, potentially re-molding its approach to political and societal questions in the process. The deck-clearing can be viewed as a victory for the Secretary of State Cardinal Tarcisio Bertone, who's sought to "revolutionize the CEI" and -- in line with then-Cardinal Ratzinger's musings on episcopal conferences -- tone down the centralized, strongman approach that's made Ruini one of Italy's leading political actors. Writing last week on Bertone, Benedict and the "war over Ruini's successor," L'Espresso's Sandro Magister indicated the one figure whose job security, or lack thereof, now becomes even more key: the CEI second-in-command Bishop Giuseppe Betori, a "staunch follower" of Ruini's whose departure Bertone has reportedly sought. In related news, the center-left government of Prime Minister Romano Prodi fell yesterday amid opposition within his own ranks to continued funding for Italian involvement in Afghanistan and the US' request to expand its military outpost in the northeastern city of Vicenza. As Rome was said to be plunged into "political turmoil," Italian President Giulio Napolitano called the leaders of the country's fractious parties together for "crisis talks" slated to extend through the day. This morning, the Pope received the clergy of Rome for their annual encounter to mark the feast of the Cattedra di Pietro, the Chair of Peter. 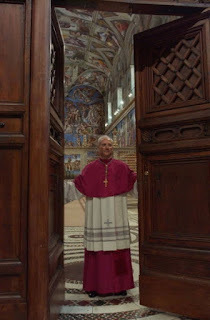 According to early reports, Benedict told his priests that he'll be signing the widely-anticipated Apostolic Exhortation on 2005's Synod of Bishops for the Eucharist "shortly." The Holy Father expressed his hope that the document might help "in liturgical meditation, whether personal, for the preparation of homilies and the Eucharistic celebration, and also to guide, illumine and revitalize popular piety." Greeting the pontiff on behalf of his diocese's clergy, Ruini -- the papal vicar for Rome -- thanked Benedict for teaching with "extraordinary clarity the mystery of our faith, in itself and with its many implications for the realities of our time." Hopefully nobody gets liturgical whiplash or anything, but the calendar veers from the reflective to the festive with today's observance of the Chair of Peter. This year, Lent's second day is overtaken by one of the church's more politically-inspired feasts, one which only spread from Rome to the wider church as the authority of Peter's successors took root as a prerogative beyond first among equals. 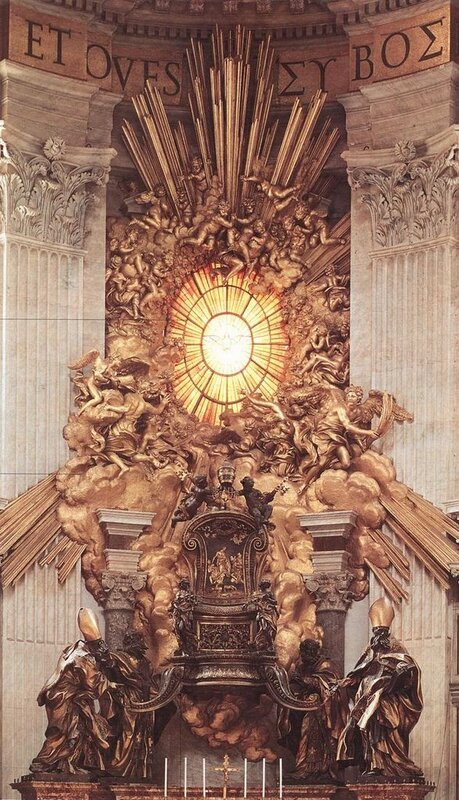 There is no functional Chair, of course -- new Popes don't hop a cherry-picker to be seated in Bernini's "Chair of St Peter" sculpture at the back of Vatican basilica (shown at right). And, aside from the dedication-feasts of the Roman basilicas, this is the only day the general calendar dedicates to an object, as opposed to a person. That's all very interesting, of course, but what does it mean? Luckily, to celebrate his first 22 February as Pope, B16 dedicated his General Audience catechesis to the subject of Peter's Chair. As the Holy See doesn't translate the audience talks, an English rendering was prepared for these pages. Just in case anyone could use it, here it goes again. On a final news-note, at the close of the audience cited above, Benedict emphasized the Petrine authority by calling his first consistory and announcing the names of 15 cardinals-designate. The nominees were given the red hat a month later, on 24 March, and received their rings the following day. While the late amato Giovanni Paolo II allowed the membership of the "Papal Senate" to fluctuate precipitously over three-year consistory cycles, Benedict -- the first cardinal-dean elected Pope in centuries -- has stated that he intends to call consistories with a greater frequency. The stance reflects the frustrations of many cardinals, voiced during the 2005 interregnum, that they didn't know each other well enough going into the intense period. Between superannuations and deaths, the number of cardinal-electors currently stands at 108, 12 short of the full complement of 120 fixed by Paul VI (and flouted by Wojtyla). Between now and May's end, four more electors reach their 80th birthdays, thus losing their conclave rights. As things stand, smart money would place the next consistory on 29 June's Solemnity of Ss. Peter and Paul. 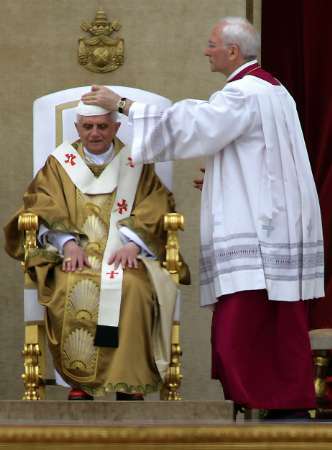 Not only is Rome's patronal feast a traditional favorite for cardinal-making, but this year's observance of it has a particular significance for Joseph Ratzinger -- the 30th anniversary of his own red hat. In the wake of January's fall of Archbishop Stanislaw Wielgus of Warsaw and the flood of damage caused by the prelate's reported collaboration with the Communist-era secret police, this Ash Wednesday is being observed as a day of prayer and penance "for all the Polish clergy." At his Sunday Angelus, Pope Benedict cited the "particular day" set aside for reparation, expressing his hope that "prayer for the holiness of priests" might bring about a resurgence of "the spirit of pardon, reconciliation and mutual trust" among the faithful of the overwhelmingly Catholic country. What the pontiff didn't disclose at the time, however, was a letter he penned to Wielgus expressing his "spritual closeness and brotherly understanding." The text was made public yesterday during a meeting of the Polish bishops and reported on by Vatican Radio. In the letter, dated 12 February, Benedict observed to Wielgus that "today, as in the past, the episcopal mission is marked by suffering. "May God not cease to sustain you with his grace," the pontiff wrote, saying that Wielgus' resignation minutes before his Epiphany Day installation in the Polish church's top post was an "act of profound sensibility for the good of the Church of Warsaw and of Poland," and a "sign" of the archbishop's "humility and discharge of duty." Wielgus "has given proof of great holiness and profound love for Jesus Christ and for the Church," Benedict said, encouraging the embattled prelate to "continue forward with trust and serenity of heart" and to keep on "in service to Christ in a manner that will be possible." As if the customary Wednesday audience, coupled with the traditional kickoff of Roman Lent on the Aventine Hill, wasn't enough for Papa Ratzi to get through today, yet another episode of brutta figura of the Polish kind has found its way to B16's plate. The Across-the-Pond press has given significant coverage to a 32-page pamphlet in which a Polish member of the European Parliament called Jews a "tragic community" who seek to live "in apartheid" from others. The Vatican angle is joined as the text's author, Maciej Giertych, is an uncle of Fr Wojciech Giertych OP, the theologian of the Papal Household. Having made his name as a professor at the Angelicum, Fr Giertych was named to the post by Benedict in late 2005. Affiliated with the conservative League of Polish Families party, Maciej Giertych ranks among the lodestars of Poland's hard-right movement, and his son, Roman, is the country's Education Minister. The family's political branch is believed to be close to Radio Maryja, the Redemptorist-run radio outlet whose polarizing commentary and forays into anti-Semitism have long caused headaches in Rome and among much of the Polish episcopate. Seemingly not for nothing, the Vatican announced this morning that the Pope made time to call his theologian upstairs yesterday for a private chat. In happier news from the interreligious front, the grand sheik of the Al-Azhar Mosque -- the closest thing Islam has to a Vatican -- has agreed to meet with Benedict on an upcoming trip to Rome. A date remains pending, but an inconvenient back-story is already solidified: while the Curia remains in tumult, its exile in Cairo clearly keeps pulling his weight. As the Lenten journey begins, the centuries have taught us well that there's no better guide to start it with than Allegri. Thank God spreading the piece is no longer an excommunicable offense. And those who get to hear this live today, know how lucky you are. As an institution better known for moving in centuries has made fits and starts at embracing a medium that moves at the speed of light, the church's presence in new technology has become a key element of interest both within and outside its walls. 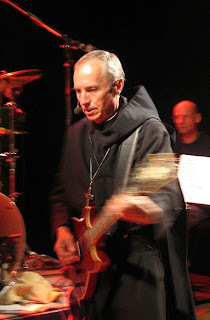 You knew that, sure, but did you know one of the sea change's vanguard players is a Long Island-born nun? 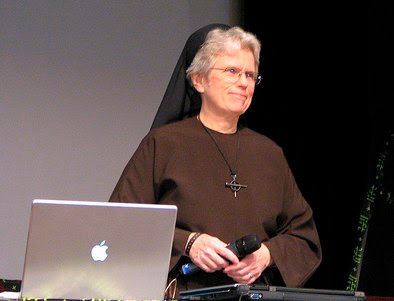 At a technology-in-society conference held last week in Geneva, one of the most buzzed-about speakers was Franciscan Sister of the Eucharist Judith Zoebelein, the editorial director of the Holy See's webpage, vatican.va, which gets somewhere around 15 million hits a day. The subject of a 2006 profile in BusinessWeek, Sr Judith -- who presented in Geneva on the importance of building community on the internet -- sat for an extended interview with a blog. In keeping with the times, the fascinating 25-minute chat has gone viral. In it, Zoebelein balances insights on technology, ecclesiology, and being short-staffed, revealing in the process that the Internet Office has just undergone a conversion experience. To Mac, that is. Deo gratias e ben fatto! Forgive James Martin SJ for seeming omnipresent -- he's filling a big need out there. In the year since his My Life With the Saints struck publishing and spiritual gold, the assistant editor of the Jesuit flagship America has become one of the church's most visible presences in media and on the speaking circuit, a demand that can be chalked up to the Philly native's engaging style and vibrant, accessible spirituality. Such is his circulation in the public square that, recently, a secular cleric reported hearing that "the Fr Martin who wrote the book on the saints" was now on-staff at the Apostolic Nunciature in Washington, and that the Jesuit was the guy to call if anyone needed anything. However (wildly) amusing the rumor may be, it's categorically false. But it speaks well to the effect a dose of exposure can have among the church's chattering class. One element of Martin's lore that has its roots long before he got to America House (and some clerics conjured him into the Vatican's service) comes from his undergrad days at the University of Pennsylvania's Wharton School. Fascinated with the discipline of Lent -- and thinking it too easy for one to choose his own sacrifice -- a group of his Jewish friends took it upon themselves to assign Martin his annual penance. A quarter-century on, the tradition's taken on a life of its own, so much so that to mark last Mardi Gras, the Jesuit recorded a piece on the unusual practice that ran on NPR. A day early, the lone remaining penance-giver called in his decision this afternoon -- three decisions, actually, in keeping with the custom. Now fulfilling his Wharton destiny in Boston, Rob Schlakman was Fr Jim's junior-year roommate. For 26 years without fail, Schlakman has dutifully selected a spice, "a sweet thing" and a substantive food that, in the name of his spiritual betterment, the Jesuit is barred from for the seven weeks leading up to Easter. Martin's "penitentiary" clearly relishes the task; so he can't cheat by gorging up on the contraband in advance, the items are usually communicated early on Ash Wednesday. Even during his mission to Kenya with Jesuit Refugee Services, Martin said a note would arrive "right on time" from the States bearing the notice of his annual sacrifices. Just in case anyone thought he's getting off easy, Schlakman's list is just a part of Fr Jim's Lenten practice, the bulk of which is comprised by a ramped-up set of spiritual elements. The tradition can't be reciprocated, of course -- in accord with the Mosaic law, the penance-giver must fast from everything on Yom Kippur, the day of atonement which marks the most sacred observance of the Jewish calendar. Last year, as the radio piece prepared to run, Schlakman informed Martin that his '06 "Lents" would be popsicles, pumpkin seeds and meatballs. One could've heard a pin drop as, milking the suspense, the Jesuit's onetime flatmate announced that this year's offerings would be anise, beets and caramel. "Caramel?!" a shocked Martin asked. "But that's so hard!" All wishes for a Blessed and Fruitful Lent to the newly non-caramelized Fr Martin, and to you all. To know what keeps B16 relaxed and Fluffy is to be aware of his affinity for two things in particular: the piano (which he makes time for on most days), and felines (which, though banned by law in the Vatican, are recalled by Papa Ratzi's collection of porcelain kitty plates, figures, etc.). Her name's Nora. Don't be surprised to see her at an upcoming papal audience. Another papal elector's slot opened in the Sacred College last Thursday as the retired archbishop of Milan, Cardinal Carlo Maria Martini SJ, marked his 80th birthday. A simple priest when he was named to the chair of St Ambrose by John Paul II in 1979, over his years at the helm of Europe's largest diocese Martini acquired a reputation as the church's progressive lightning-rod, whether advocating a new ecumenical council or, as he did last year, opining that the use of condoms in cases of a partner infected with HIV/AIDS constituted a "lesser evil." Sure, there are those who view Martini -- who, in accord with his fervent wishes, returned to Jerusalem on his retirement in 2002 -- as an incarnation of the Antichrist. But proving yet again that Joseph Ratzinger is a Pope his pre-electoral base won't listen to, said line of thought has been firmly repudiated by none other than Benedict XVI, himself. Since his election, the sitting Pope has relied more heavily on few, if any, of his cardinals as a sounding board than Martini. The retired porporato has been received in audience by the pontiff with a frequency reserved for most dicastery heads, and on a visit to the Roman seminary at the weekend, Benedict revealed that he and Martini exchanged a very personal and very warm set of letters to mark the latter's milestone. "We are of the same age," Benedict, who turns 80 on 16 April, mused. In truth, Martini has always been more traditional, and Ratzinger more modern, than the stereotypes might suggest. That they have differences on some important questions, however, is not in dispute. Another reminder of the point came on Saturday, when Benedict XVI held a meeting with seminarians at the Roman Seminary for the Feast of Our Lady of Confidence. The pope was asked six questions by the seminarians, which had been submitted in advance and released to the press. They ranged from asking the pope to reflect on his own priestly formation, to his thoughts about how to avoid careerism in the priesthood. The fact that the questions were pre-arranged means that Benedict had plenty of time to craft his answers. In the course of responding, the pope cited a number of sages, most prominently St. Augustine, who loomed so large in his own intellectual and spiritual formation, St. Ignatius, and St. Bakhita, the former Sudanese slave canonized by John Paul II in 2000. The only living figure cited by the pope, however, was Martini. As a final decision on either a "very, very painful" abuse settlement or declaring Chapter 11 bankruptcy protection looms over the diocese of San Diego, the clergy of the Southern California see met in plenary assembly yesterday with Bishop Robert Brom and the diocesan lawyers. Later today, Brom, his vicar-general, attorneys from both sides, representatives of the insurance provider Catholic Mutual and a judge overseeing the diocese's 143 unresolved claims will sit for a final meeting. The session's result will dictate whether the diocese can settle the suits or becomes the fifth US local church to enter into a court-supervised reorganization of its finances. Word of the impending decision, shared with parishioners at Sunday Masses in the 950,000-member diocese, was first reported here earlier in the weekend. Although the potential still exists for a settlement which could end up being the largest a US diocese has signed to date, the clergy present "seemed to understand" that Chapter 11 would be the more likely course of action, according to a priest present at the session who briefed Whispers on condition of anonymity. Attendees were given forms in preparation for a "possible" bankruptcy filing -- and, given the word's negative connotation, diocesan officials have sought to banish it from the local church's vocabulary, with "reorganization" being the chancery's term of choice. As quilt-bearing representatives of the Survivors' Network of Those Abused by Priests (SNAP) and a horde of TV cameras lingered outside the diocesan offices, the afternoon gathering was addressed by lead defense counsel Mike Webb and Chapter 11 attorney Susan Boswell of Tucson, who aided the Arizona diocese with its reorganization. Boswell has been named as a "special counsel" to the San Diego curia in the event of a bankruptcy filing there. While settlement was described as being "by far" the optimal scenario, the officials said that the bankruptcy alternative is being eyed as a remedy to ensure the "most just and equitable solution" for abuse survivors, as litigation would disproportionately benefit those with early trials and leave later cases with few remaining funds to spare. Over two years of settlement negotiations between the diocese and attorneys representing victim-survivors have led to no resolution, with the diocese offering what's been termed a "really significant amount" that would break the diocese of Orange's US record of $100 million and plaintiffs' counsel countering with a figure so high that one official reportedly described it at yesterday's gathering as "ludicrous." The impression seemed clear to attendees that a settlement would only come to pass "by some miracle." If filed, the cost of a San Diego Chapter 11 would be sizable even before its payment. Tuscon's bankruptcy fees alone were in the range of $2 million, with the archdiocese of Portland in Oregon's reorganization costs said to run close to $16 million. Among the process' added "pains," the priests were warned to prepare for a future of consolidated or "twinned" parishes. Were a settlement to be struck, the diocese would be obliged to refer parish requests for financial aid to affluent parishes, as the chancery would be unable to provide such assistance. The single biggest issue in the fiscal puzzle remains that of the diocese's "restricted funds." While officials estimated the pool of unrestricted assets at $15-20 million, the potential that the diocese's designated resources, said to be in the $100 million range, could be judged in court not as a separate trust but as an asset of the corporation sole is believed by some to be a key element behind the last-minute push to avoid trial. Originally scheduled as a pre-Lenten day of reflection, the priests' assembly began with Daytime Prayer from the Liturgy of the Hours and the singing of "O God, Our Help in Ages Past." Whether its selection was a nod to the gathering's subtext remained unclear at press time. As many of you know, the Italian hierarchy has waged war on DICO, as the proposal granting marriage-esque rights to cohabitating couples is known in the native tongue. Led by Cardinal Camillo Ruini and filling page after page of the episcopate's daily newspaper L'Avvenire, the CEI's counter-push is ostensibly being undertaken with the backing of Italy's primate -- Benedict XVI -- who's said to view it as the "mother of all battles." Not far off the Boot's southwest coast, however, the newly-named archbishop of Malta is causing a stir by responding to a similar proposal in the Catholic mecca with what's been called a "resounding 'yes.'" A B16 appointee who served as a parish pastor on the island before being named to its top ecclesiastical post, Archbishop Paul Cremona OP was ordained and installed but three weeks ago. Mgr Cremona said that the Church has already made it clear that the state must legislate to safeguard the rights and interests of those who live together, including, for example, brothers and sisters who share the same house. This was also the declared aim of those proposing the new law in Italy. Referred to as DICO (“Diritti di coppie conviventi”, or “Rights for cohabiting couples”), the Italian government’s proposals fall short of the civil unions introduced in France, Britain and Spain in recent years. The DICO bill would give cohabiting partners, irrespective of sexual orientation, inheritance rights after nine years of living together, and alimony rights after three. It would also allow one partner in a couple to take decisions on funeral arrangements and organ donation when the other died. According to the new law, cohabiting partners will have to go to the registry office to declare their de facto union, but no ceremony akin to marriage will be celebrated. In fact, the partners do not even need to register the union at the same time. “These are all new rights: none is equivalent to marriage,” Italian family minister Rosy Bindi insists, to the consternation of those who wanted more wide-ranging reforms on the model of Zapatero’s Spain. But for all the linguistic acrobatics conducted to appease the Catholic Church, the Italian government still ended up bearing the brunt of Papal condemnation. “No man-made law can subvert one made by the Creator without society being dramatically damaged in its very foundation,” the Pope said in reaction to the bill approved by the centre-left government last week. Perhaps wary of treading on the Church’s traditional monopoly on family affairs – unaltered by 160 years of British rule, and only remotely tampered with by Dom Mintoff – the Maltese State has left cohabiting couples in a legal vacuum. Relegated to the status of second class citizens, they have no right of inheritance if their partner dies without leaving a will, no rights to the common home if abandoned by their partner, no say in any decisions affecting their partner’s health and not even a legal right to organise their partner’s funeral. But with 40 per cent of respondents in a MaltaToday survey claiming to have a relative who cohabits with a partner, the Maltese political parties are now walking on a tightrope. Archbishop Cremona’s green light came as a blessing to the Malta Labour Party, which has been busy approving a document that widens the definition of the family to include different forms such as unmarried and gay couples. Back in 1998, the Nationalist Party had also proposed recognising the rights and obligations of cohabiting couples. Yet the apparent go-ahead given by Archbishop Cremona could prove deceptive if wrongly interpreted. Ultimately, the church position on the subject will depend on the way the law is worded. Getting the church’s blessing for any law concerning the family could prove elusive, even for the most Catholic of politicians. One of the authors of the Italian law is Rosy Bindi, known for her strong Catholic convictions. The law strayed away from giving any semblance of marriage to cohabitation. Yet it was still deemed unacceptable by the Pope. Informed sources within the Curia told MaltaToday that Cremona’ s position does not represent any departure from official church teaching. Even Cremona’s conservative predecessor Mercieca had called on the state to protect the rights of children born out of wedlock, and to legislate on cohabiting partners’ duties towards one another. “When a cohabitation comes to an end, the state should also ensure the protection of the natural duties of one party towards another party and towards children,” the Maltese bishops said in a joint statement in a 1999. The Curia also told MaltaToday that the Church would be willing to accept legislation that safeguards the individual rights of cohabiting persons. SVILUPPO: The Malta curia has issued the following clarification, printed below in full. Mgr. Paul Cremona O.P., the Archbishop of Malta, would like to clarify as follows regarding what has been stated concerning his position vis-a-vis marriage, cohabitating couples and other relationships of persons living under the same roof. It is essential that one makes a clear difference between issues concerning what constitutes marriage, and the need to ensure justice in the various realities of relationships between persons. As has been clearly stated by the Maltese Bishops in their statement of 24 March 1999 , the Church can never approve cohabitation or any measures that may encourage it. The Church believes that the State has to pay attention to maintain and sustain a full and clear distinction between the status of marriage and the status of cohabitation, which are and remain two different realities. The Church also believes that the State cannot encourage cohabitation or appear as if it were doing so. On the contrary, the State should do its utmost to strengthen the family built on marriage and so encourage everybody, primarily young people, to choose responsibly a mutual, full and permanent self-giving in marriage -- and not experiments in frail unions where one could abandon everything as if nothing had happened. As has also been stated in the 24 March 1999 Maltese Bishops' statement, as regards cohabiation the State should protect the rights of those concerned, especially the children that may be born. It should see that everybody shoulders the responsibilities of his or her actions and that nobody evades such responsibilities. Even when, for some reason or other, cohabitation comes to an end, one has to ensure the protection of the natural duties of one party towards another party and towards children. Whoever lives a similar union that comes to an end should remain accountable for these obligations and the State should ensure the recognition and safeguarding of every right of those concerned. At the same time, one has to continue to keep in mind that marriage and cohabitation are not the same thing and can never be considered as if they were the same thing, not even when the State comes to determine the rights and duties that emerge from cohabitation. When one speaks about State determination of rights and duties of persons living together in an experience which is different from that of a marriage between a man and a woman, one should not limit oneself to cohabitating partners. One should take into consideration the rights of other persons living together under one roof and sharing their lives with each other perhaps for many years, for instance brothers and sisters. Congrats to our friends at Sirius Satellite Radio's "The Catholic Channel," whose potential audience will soon grow... by about 8 million. Capping months of speculation, Sirius and rival pay-radio provider XM have announced that they will merge. The move ends a war between the two companies over subscribers and content which has drained revenue from both. Once the deal closes after a steeplechase of regulatory scrutiny, the combined 14.5 million subscribers of the merged entity will enjoy a lineup that combines the marquee talents of both outlets, from XM's pickups of Bob Dylan, Oprah Winfrey, ACC Basketball and Major League Baseball to Sirius' stable of Sinatra, Stern, NPR, NASCAR, the Metropolitan Opera -- and Lino Rulli & Co., of course. In its preliminary announcement, the companies said that the likely route going forward would result in customers choosing their own lineups "on a more a la carte basis," as opposed to the universal cost and content menu currently offered by both. Sirius is also the exclusive sat-rad provider of EWTN, although the company's 300,000-member Canadian outpost dropped it from its lineup amid a programming change last week. XM offers three Christian music channels, while Sirius hosts two religious music channels and three talk streams. Launched in early December in conjunction with the archdiocese of New York, the Catholic Channel was recently added to Sirius' online-listening service, a free three-day preview of which can be obtained here. Bishops say many words to one another – just as they say many, many words to you. Very early in the history of the Church there was a great saint who said that God was especially evident when Bishops are silent. But that is perhaps only to say that there is one thing to say to another bishop, that a bishop should say to God’s people and God’s people should say back to a bishop; I remember two things; that I am a great sinner and that Christ is a great saviour’. The "silent" talk comes from St Ignatius of Antioch, who said in one of his letters that "[T]he more anyone sees a bishop to be silent, the more reverence he should feel towards him." He observed the same on another occasion -- "amazed" at one bishop's "moderation," the first-century father of the church deemed a quiet prelate "more powerful than those who speak." Of course, the line's been predominantly interpreted as a veiled jab at the vocal primates of the Global South, particularly Archbishop Peter Akinola of Nigeria, the lone national representative absent from yesterday's Eucharist in Zanzibar. Intriguingly, though, it's Ignatius who also provided for posterity the image of the bishop of Rome "presiding in charity" over the churches. Repeatedly cited by Benedict XVI since his election, the line is a favorite of the sitting pontiff, who even pulled it out at last year's Ecumenical Vespers to mark the close of the Week of Prayer for Christian Unity (...a speech Williams will have undoubtedly read). In light of the freshly-leaked reconciliation proposal, could the über-perceptive Canterbury -- shown above visiting a former slave market during the primates' island escape -- be employing Ignatius to show his hand? Suffice it to say, stranger things have happened. And no, Rowan's Roman Eucharist is not one of them.